On November 23th, Hanoi, the Committee for Ethnic Minority Affairs launched the "The Security-Politics situation of the world, Vietnam, ethnic minority and mountainous area nowadays" conference for members of the Party Cell Executive Committee; Secretary, Deputy Secretary, Standing member of Ministries, leaders of Departments, offices; Executive Committee Executive Committee of trade unions. 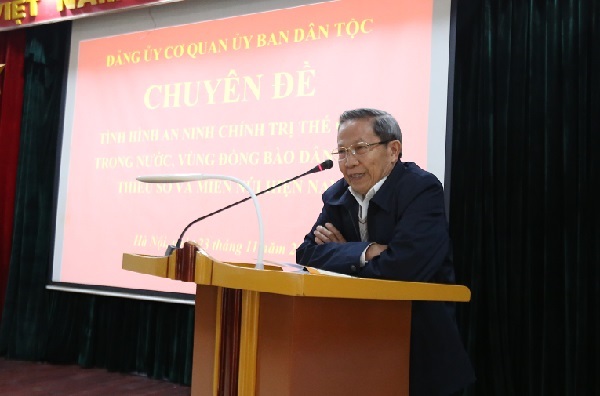 At the conference, the representatives were listened to Vice Professor, PhD and Brigadier General Le Van Cuong – former Director of Strategy and Science Institute of Ministry of Public Security provided new information as well as explained some issues to clear the outstanding security – politics situation of the world, area and Vietnam nowadays. Brigadier General Le Van Cuong emphasized some crucial issues of the Party, Government after the Twelfth National Congress in developing economy; combat corruption, foreign relations; the political situation in ethnic minority area; the efficiency of policies for ethnic minority area; strategic partner relationship between Vietnam and other nations; the relationship between UK and other European countries, between Russia and USA and the prediction of relationships in the future, etc. Through the conference, the representatives had learned the contents introduced by the speaker. Therefore, they can raise themselves awareness, contributing the right evaluation of situation and apply it to their work in an effective way.